Mindful Return is a movement that helps new moms and dads navigate the uncertain terrain of working parenthood. Are you ready to trade your working parent guilt for meaningful connection and support? overwhelm, guilt, uncertainty, and fatigue sets in. Mindful Return makes this vision a reality. That first year of working parenthood is, quite possibly, the hardest year ever. You care deeply about the work you do out there in the world and about supporting your (now larger!) family. AND you love love love that little baby who is either on the way or just recently arrived. You want to be able to focus on your baby. And on your work. You don’t need to figure out this working parent thing by yourself. The Mindful Return Community has your back. 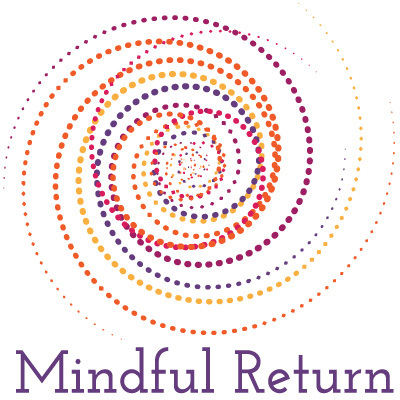 Who are the members of the Mindful Return Community? We are working parents who are passionate. A bit terrified, at times. Committed to growth. Loyal to our fellow working parents. And compassionate. What is Mindful Return committed to? Helping new parents feel calm, supported, confident, and connected. Challenging the workplace status quo. Helping employers retain their new parent talent. Diversity and respect for differences. Lifelong connections to other working parents. How does Mindful Return live this mission? Through two 4-week online programs that focus on the following themes: (1) a mindful mindset for returning to work after baby; (2) managing all the logistics; (3) growing leadership skills as a new parent; and (4) building communities of other working parents. More about the mom version of this program is here. More about the dad version is here. More about the version of the program for moms of special needs babies is here. By helping 40+ employers provide the Mindful Return courses to their employees as an innovative benefit and by holding workshops with groups of employees. By connecting all Mindful Return course alumnae to one another through a private Facebook community. Through Lori’s book, Back to Work After Baby: How to Plan and Navigate a Mindful Return from Maternity Leave. By providing timely and topical advice through a weekly blog post and weekly newsletter called Saturday Secrets. Becoming a working parent shouldn’t be something you have to “get through” but something you get to create. You’ll return to work a different person you than when you left, with new skills that are – yes indeed – useful at the office. You’ll have different priorities. Different goals. And likely you’ll be sleep deprived those first few months and just trying to figure things out. But it’s a new, exciting phase of life worth being thoughtful, intentional, and not terrified about. Let’s explore here, together, how to create a mindful return.